Mushrooms are one of those vegetables that you either love or hate. For those who dislike mushrooms, it’s usually texture that puts people off more than the taste, while it’s those same qualities that attracts those on the other side of the aisle. One of the reasons I like mushrooms so much is that they often absorb the flavor of the food or sauce in which they are cooked. And that’s precisely the reason I wanted to give chicken marsala a try, mushrooms being one of the key ingredients. I had never made the Italian favorite before this past weekend and with a package of mushrooms in the refrigerator that needed to be used, there wasn’t a better time. 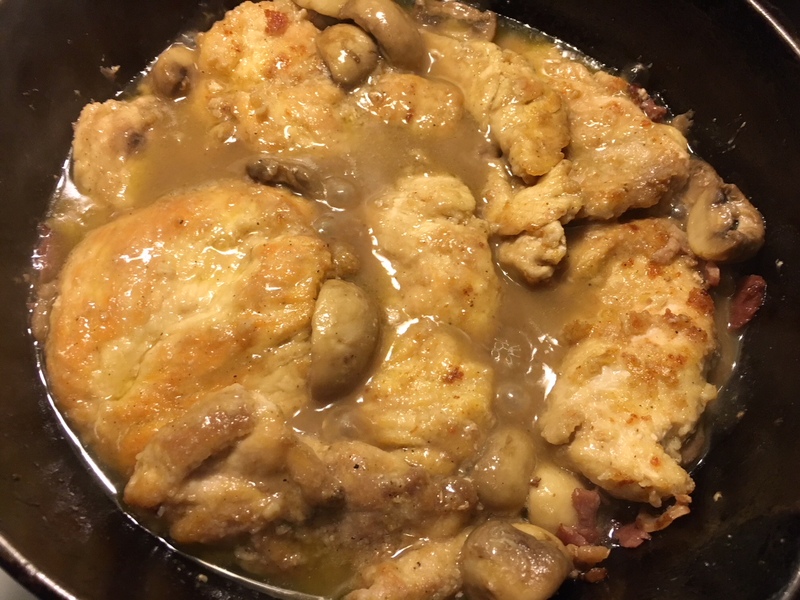 The following recipe for chicken marsala is pretty straightforward — and everything I wanted. Chicken marsala isn’t for those who want a quick meal in a short time. It requires about 20 minutes of preparation and 20 minutes of cooking, but it is time well-spent and an entree that any mushroom aficionado would love. Put the chicken breasts side by side on a cutting board and lay a piece of plastic wrap over them; pound with a flat meat mallet, until they are about ¼-inch thick. Put some flour in a shallow platter and season with a fair amount of salt and pepper; mix with a fork to distribute evenly. Heat the oil over medium-high flame in a large skillet. When the oil is nice and hot, dredge both sides of the chicken cutlets in the seasoned flour, shaking off the excess. Slip the cutlets into the pan and fry for 5 minutes on each side until golden, turning once — do this in batches if the pieces don’t fit comfortably in the pan. Remove the chicken to a large platter in a single layer to keep warm. Actually, there wasn’t that much sauce left over. The chicken and mushrooms soaked up a bunch of it. It was yummy!! !